Jointly acquired for the collections of Tullie House (Carlisle), Gallery Oldham, Harris Museum & Art Gallery (Preston), Touchstones Rochdale and Nottingham City Museums. Acquired for Amgueddfa Cymru — National Museum Wales (Cardiff). Ocean is the first acquisition to be announced from The New Story of Craft purchasing scheme at the Contemporary Art Society. This new model of joint acquisition enables institutions to work collaboratively to acquire ambitious large scale craft pieces for their collections which would be beyond the scope of an individual institution. Natasha Daintry is a contemporary ceramicist based in London. She studied at Surrey Institute of Art and Design and subsequently at the Royal College of Art, graduating with an MA in Ceramics & Glass (2000-2002). She has since built up a national and international reputation for her studio work in porcelain in a spectacular range of coloured glazes. 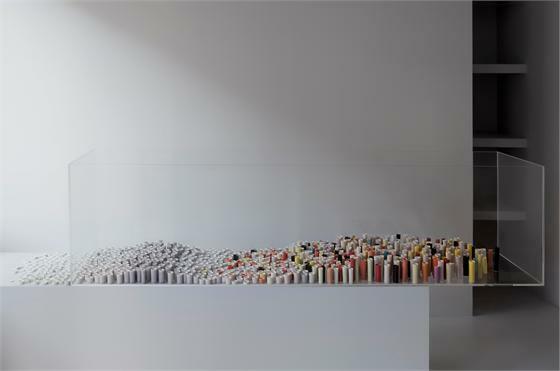 Ocean, an installation of 1,000 slip-cast porcelain pots, is considered one of Daintry’s finest works to date and encapsulates her most important artistic ideas concerning texture, colour, form and space. The pots are arranged to form the undulation of an ‘ocean’ exploring Daintry’s fascination with reality and how she sees the world. Her interest in the natural world emerges through the materials of clay and water, the organic shape of each pot and through the installation itself. Ocean will be first shown at Gallery Oldham in October 2012. Acquired for Amgueddfa Cymru — National Museum Wales (Cardiff), with support from the Derek Williams Trust. We are delighted to have acquired Hill of Hurdles for National Museum of Wales which will be a wonderful fit with their permanent collection. Amgueddfa Cymru — The National Museum opened in 1927, and has an outstanding collection of 20th-century art, including works by Jacob Epstein, Eric Gill, Sir Stanley Spencer, LS Lowry and Oskar Kokoschka, as well as the largest holding of work by Gwen John and Augustus John. The contemporary collection includes notable works by Frank Auerbach, Lucian Freud and Rachel Whiteread. In July 2011, following a £6.5 million refurbishment, the museum launched the National Museum of Art with six new contemporary galleries. 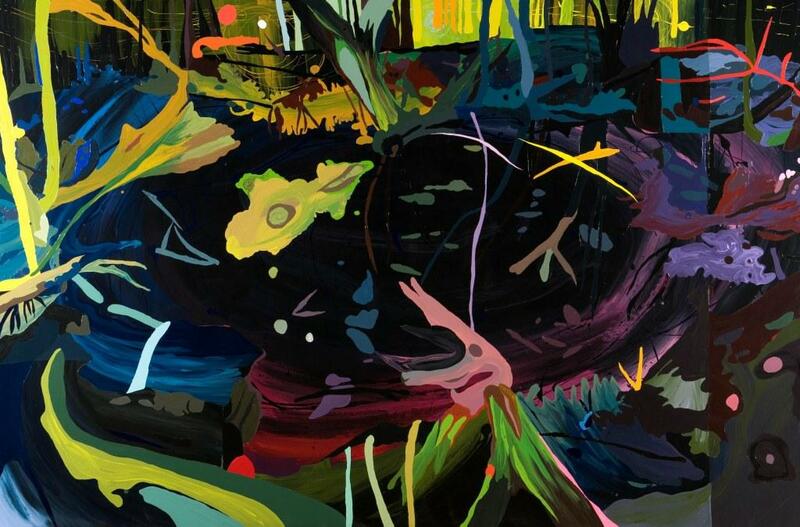 Clare Woods, born in Southampton, completed her BA at Bath College of Art and her MA in Fine Art at Goldsmiths College of Art. In the past few years she has exhibited widely both nationally and internationally, most recent in the UK was her solo exhibition Brimham Rocks at The Hepworth Wakefield in 2011. Woods is currently based in Kington, Herefordshire, where she finds much inspiration from the surrounding landscape. Her painting, Hill Of Hurdles, is inspired by the landscape around a particular waterfall, ‘Water Break-its-Neck’, an area close to the border between England and Wales. Photographs of these locations, taken at night, are collaged together to create compositions described by the artist as ‘supernaturally charged’. The polished surface of the paintings and seductive layering of colour draws the viewer into an imagined experience of landscape. Woods is inspired by many of the works already within the collection at Wales, where her work has been acquired, such as those by Paul Nash, John Piper and Graham Sutherland. Hill of Hurdles will be on display in New Perspectives: Landscape Art In Wales since 1970 at The National Museum from 23 June – 19 August 2012. Image credits (from top to bottom): Natasha Daintry, Ocean, 2009 © the artist 2012. Clare Woods, Hill of Hurdles, 2010 © the artist, courtesy the artist and Stuart Shave/Modern Art. Join us and support the Contemporary Art Society mission to acquire new work for UK museums.